My original specialisation when I did my medical training was in obstetrics and gynaecology, and that comes by quite handy working for an NGO. Pregnant women and babies with problems are everywhere in low-resource settings. My Afghan adventure started two weeks ago on a flight from Istanbul to Kabul when at 4:30 am someone suddenly had an urgent medical problem and they asked a doctor to look at the patient. Well, ‘urgent’ turned out to be relative. The 'patient' in question appeared to suffer from an allergy with a running nose and could not sleep. After my initial relief (everyone who has ever taken a flight as a doctor knows that you do not want anything serious on board) I became a bit annoyed. I gave the patient an antihistamine (which is not only antiallergic but also causes people to doze off) and said that he had to try to sleep (and especially let others sleep!). Kabul was cold and snowy. The mountains were, as always, beautiful; in other times tourism could really flourish here, and 40 years ago the hippies travelled through Afghanistan to India. Now, well... after this 16-year, very expensive (both in economic terms and in human lives) American war, the country is not in good shape (that’s a euphemism). And sadly for the people here, no one really sees it improving in the coming years. Khost is situated at 800 meters altitude and is warmer than Kabul. Certainly during the day temperatures are pleasant here. At night it's freezing, so not easy if they call you at 4 am for some emergency (at least here it's a real one, not like the running nose on the flight!). The biggest attraction in the last few days were quintuplets born a few weeks ago. Sadly one of them died, but the others are between 1.1 and 1.4 kg (all 2-4lbs) and they are doing relatively well. Neonatal nurse Elena with the quintuplets. Photo: MSF. The mother originally thought she was pregnant with triplets, because she had an ultrasound beforehand and they talked about three babies. But then five were born. Well, that’s life in Khost: we see a lot of twins (and triplets and ...). It’s because there is a lot of pressure from the family and the husbands on women to get pregnant quickly. Fertility pills (Clomid) are readily available, especially because we are close to the Pakistani border and in Pakistan you find most things on the local market. It means that loads of meds are being swallowed without any medical guidance whatsoever. We have another 1.3 kg (almost 3lbs) baby in the neonatology ward: a boy, born two days ago. His mother is 17 years old and had high blood pressure with convulsions (eclampsia). This is something you hardly ever see back home in Belgium, but here we see an average of one per week. Eclampsia is a condition with a 5-10% chance of dying for the mother, but this mum is doing fine now, and the little one is our 'survivor of eclampsia' and is doing quite ok so far. Mothers and families (this is the culture) are often more motivated to care for a boy, and it is sad but the gender of the child is a factor that plays a part here in their chance of survival. We have also had to operate on two women in the past two to remove their wombs after they had delivered. One had uncontrollable bleeding and the other a tear in the womb. The mothers survived and fortunately they already had seven and nine children respectively. One of the women needed four units of blood and has given us quite some stress, but she went home with a big smile today. Perfect. The biggest medical problem we have admitted at this moment is a young woman who went into labour after six months of pregnancy. She had hypertension, a congenital abnormality in her bladder and has a fistula (an opening between the bladder and the skin) which makes her incontinent for life. Presumably her uterus is not normal either, which is why the baby was born and died at six months' pregnancy. One of the women needed four units of blood and has given us quite some stress, but she went home with a big smile today. Perfect. This mother’s kidneys almost have stopped functioning. The first few days we still had hopes that it was pregnancy-related so would resolve after she had given birth, but it is not improving. And on ultrasound, one kidney does not seem to work at all, the other seems to be relatively normal. 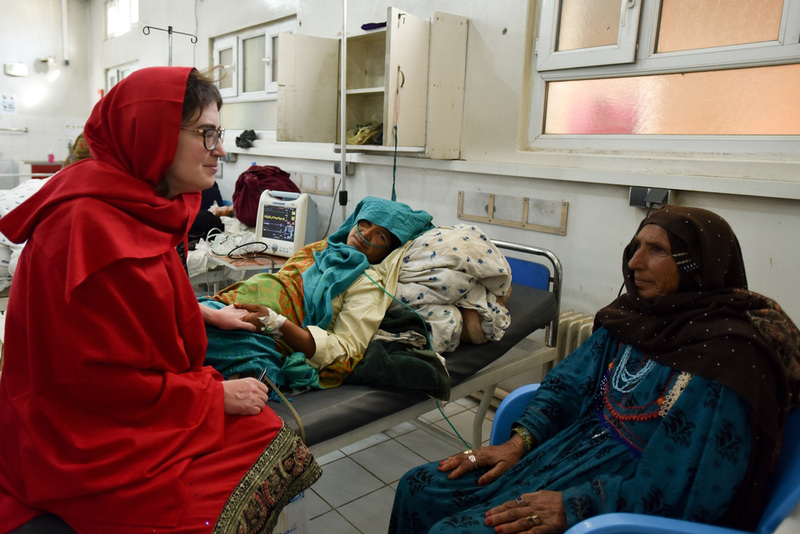 There is a hospital in Kabul, supported with foreign money, where they operate on fistulae. We have contacted them and they will examine her to consider the possibility of reconstructive surgery. The team here is super nice; we are 14 people of nine different nationalities. There is an Italian nurse named Elena who has pasta-making and croissants-and-brioches-baking as a hobby. Great. We're going to eat well tonight - especially because someone (I do not know how) was able to transport four kilos of frozen shrimps with an icepack from Kabul to Khost. In Kabul you can now get everything (peanut butter, salmon, Nutella), probably that’s related to the Americans who have been here for so long. The shrimps are certainly import because Afghanistan is a landlocked country. Warm greetings from Khost, with 23,000 babies born in 2017, it’s sure to be busy in 2018!